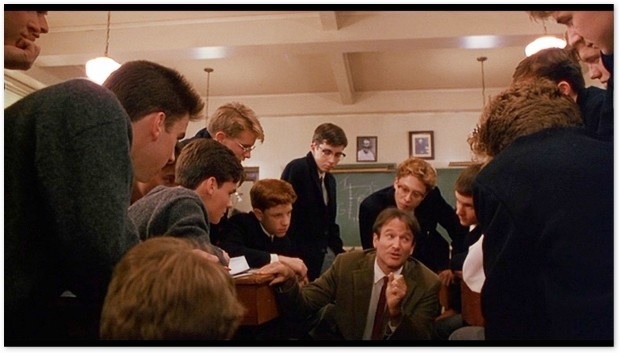 Back in the Day: “Dead Poets Society” (June ’89) | brainsnorts inc. Comic book pages can look great from a distance. Just ask Vivek. However, when you get up close enough, it’s really just a bunch of different color dots. There are also some movies that seem brilliant until a close examination shows they aren’t as great as you first thought. One of those is Dead Poets Society, Oscar winner for best original screenplay (Tom Schulman) and nominated for best picture, best director (Peter Weir), and best actor in a leading role (Robin Williams). Enjoy it from a distance, but don’t get too close. For years I have adored this movie more than I should but for several justifiable reasons. I rarely dislike a Williams performance. In DPS he plays a new teacher who gains the admiration of students by going rogue in an upper-crusty New England boarding school from which he graduated. It’s a place in which men believe that being a graduate from there means they did something special, but boys believe that being sent there means they did something wrong. John Keating (Williams), the well-meaning, kind-hearted rogue is the kind of English teacher I was in more ways than one. Neil Perry (Robert Sean Leonard), who burns to be an actor despite his father’s insistence on medical school, is the kind of English student I was in more ways than one. Williams is terrific as the mentor who inspires the boys to think for themselves, embrace their inner artist, climb out on those distant limbs, and learn from the limbs that break. He doesn’t really do much of anything except speak passionately about poetry and life, and explain what “Carpe Diem” means, both easier to do when there was no Internet. They easily buy into it but likely because there’s little else to do there except get yelled at for not wearing a tie. The boys learn of the Dead Poets Society, a rowdy group created by Keating when he was a student there. Naturally, they create their own group. They hang out in a cave and act like most other kids when the grown-ups are away. They experiment with alcohol, celebrate romantic poetry, and talk about girls. None of that is very original or outstanding, but somehow it manifests into more confidence and inspires them to live and live more boldly. It really comes from nothing, but their joy is infectious enough to buy into. They have the fun we should all have had in high school. Just overlook the lack of substance and reason and it will all seem like Hogwarts for teenage boys who play with a different kind of wand. It’s predictable but plausible how the teacher is going to influence the class, and that’s okay. For anyone involved with education, acting, or writing, it’s a film you’ve likely enjoyed. Just don’t look too closely at the flaws. I usually hate movie teachers, especially when they magically win over rebellious kids, like Jennifer Garner in Freedom Writers and Michelle Pfeiffer in Dangerous Minds. However, I can accept Williams easily even though these kids are not quite rebellious as much as they are just dull. Nothing is a surprise in this film, but it is enough to be enjoyable. Nothing is special, but the kids act like it is, so it feels to us like it is. Predictably, Keating is reprimanded for encouraging such nonsense as ripping pages from their books, standing on desks, and other things that would never really happen at the Ivy League prep school. Also predictable is that Keating’s job is eventually on the line, the boys’ libertine expressions go too far, and one of the stubborn fathers learns the hard way that being a parent does not mean being as obnoxious as your alma mater. The ending brings tears to most eyes, including mine, as long as I’m watching through rose-colored glasses. What is further notable about how Keating is portrayed as a teacher is that the embodiment of his role is what many teachers hope to be. In the late 80’s when I started out in education, I was as idealistic and – I hope – as inspiring as he is shown to be. Today, it’s impossible. Today’s educational system is so tied to the Common Core Curriculum that there’s no room to inspire anyone to do anything other than fill out a graphic organizer and write the same damn essay as everyone else because it’s very easy to get an A- if you just follow the pre-written steps. Schools today are for robots. Classes could be taught by Maxx Headroom with a better flowchart and vocal track. Although there is and will always be a great need for teachers like John Keating, there’s literally no time in the school schedule for what he could provide. But that’s an essay for another day. Other notable writing credits for Oscar-winner Tom Schulman are Honey I Shrunk the Kids, What About Bob?, and 8 Heads in a Duffel Bag. Veteran director and 6-time Oscar nominee Weir is best known for Witness, The Truman Show, and Master and Commander. I’ve seen and enjoyed all of those except 8 Heads, which I’m sure I’ll never see. But I am sure I’ll watch Dead Poets Society again sometime soon. I love this movie, always have. Don’t need rose colored glasses to love it. i never fail to have a good feeling watching it, but i do have to overlook a few things. Well you know the insides, I just get to watch without knowing anything other than it is a feel good movie. then the movie did its job well. BB alert …. maybe best ever. Dangit. Not near TV all day. Thanks for trying. KB outfits are worst ever. Bummer … I feel your remorse.